LOCATION, LOCATION, LOCATION. This lovely and affordable 3-bedroom, 2-bath cottage and its twin cottage next door, Key Lime (Listing #33828), are located at the Cottages at Camp Creek, a small, quiet, family-friendly coastal community of Old Florida style cottages with tin roofs and large covered front porches - perfect for relaxing any time of year. Nestled in the lush native dune environment and far from fast food, high-rises, and busy roads (which is particularly nice in peak summer months when you want to avoid the areas with a lot of traffic), this cottage is only 200 yards (4-5 minute walk) from an uncrowded Blue Wave certified beach known for high dunes, white sand, and emerald water. Once you see our beach, you'll understand why Travel & Leisure magazine says 'nothing in this country compares with the white-flour beaches of the Florida Panhandle', Frommers listed the Florida Panhandle beaches among their top travel destinations, and Yahoo listed this area of the Panhandle as one of their top beaches for 2011. Located along Scenic 30A (a 15-mile winding beach road), this spacious and sunny one-story cottage is in a prime location, just steps from the pristine 7500 square foot pool yet not right on top of the pool so you can enjoy quiet and privacy on your large fully-furnished front porch that looks over a peaceful little yard surrounded by pretty native plants and trees. It's great for adult and children to have a large pool to swim in on the days when the ocean is rough and it's great to have a fully-furnished covered porch for relaxing on a rainy day. 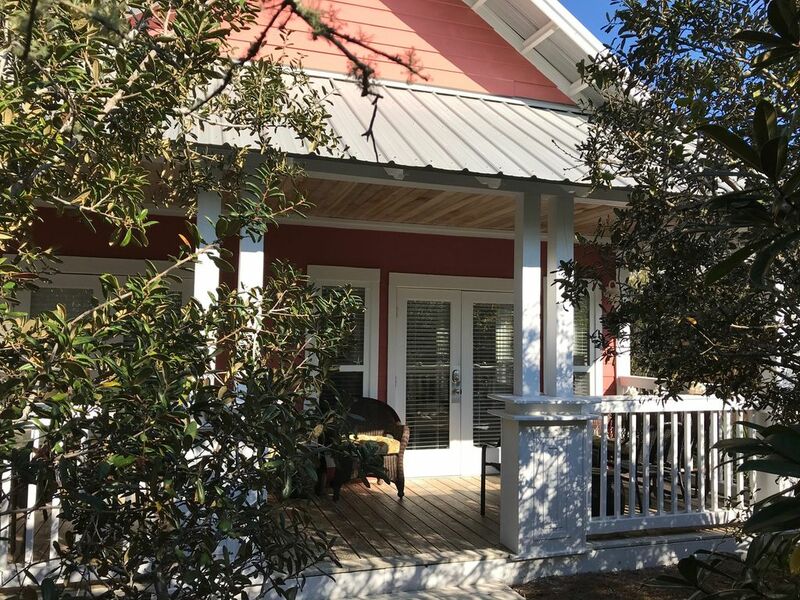 As you can see from the location map, Good Life is also one of the larger one-story cottages and is one of the closest cottages to the beach, with the Timpoochee Trail, a 17-mile paved walking, running and biking trail, across the street. As our guests will tell you, we furnish and equip our cottage to feel like a comfortable and very well equipped beach home rather than a vacation rental. A travel writer who stayed at our cottages for a wedding wrote a newspaper article saying that our cottages are 'tastefully decorated with many personal touches' and 'immaculate.' The living room (with large flat screen TV/DVD/CD player), dining area, and fully-equipped kitchen have hardwood floors, ceiling fans, and plenty of comfortable seating for quietly relaxing, reading or watching movies, playing games, and doing puzzles together. All bedrooms have flat screen TVs and ceiling fans. We also provide free wireless Internet. Furnished in a casual beach cottage style (with new Marshall Gold down-filled slip covered chairs/couch for easy-care and comfort), the dining and living area opens to a large porch furnished as an outdoor room with a cafe table with 4 chairs, love seat glider & chair surrounded by a small private yard with gas grill. When you want time alone, retreat to the privacy of your bedroom. All are comfortably furnished with high-quality cotton quilts and family cable TV. The romantic master bedroom has a king bed, private travertine-tiled full bath, French doors opening to front porch, flat screen TV and DVD player. The two other bedrooms (one has a queen bed and twin bed, and the other has 2 twin beds that can be used separately or brought together to make one large bed) are decorated in a charming seaside cottage theme. You could easily pay a lot more for such a well-equipped and well-located vacation place, but why pay more when you can have a great vacation experience and use the money you save to dine out at the many restaurants in the area, rent bikes, shop or stay a little longer! Note: No pets. No smoking. At least one guest booking and staying at the cottage must be at least 25 years old because this is a family-friendly community. Parking is available for 2 cars (all cars must be parked in parking spaces) with extra parking nearby. Parking of RVs, motor boats, and jet skis are not allowed in this community. These rules are enforced by our association, as well as by the rental agency, to ensure that all guests have a safe and relaxing vacation. We live in the cold snowy Midwest and we are big believers in vacations! We have been the sole owners of this cottage and have taken excellent care of it for our guests ever since. We come to the cottages with family and friends. Sometimes we use both cottages together, and we stay in one cottage and our friends stay in the other cottage (we also own Key Lime next door VRBO 33828). Unfortunately, we can't be there all the time, so we're happy that our guests can enjoy them when we're not there! We decided to buy our first Cottage, Ahhh The Good Life, at the Cottages at Camp Creek because we loved the location, as well as the charm, of the community. It is a quiet community - perfect for families, away from the busier and high-traffic communities, yet close enough to anything we need - Publix, gas stations, restaurants, coffee shops, children's playgrounds and beautiful parks and walks at Alys beach, Rosemary Beach with everything it offers, and the the 13-mile walking/biking trail across the street). We spend most of our time at the quiet uncrowded beach with stunning sunsets across the street, at the very big pool (I like swimming laps every morning that I'm there and we all like relaxing on floats and reading magazines/books), and dining or relaxing on the large covered porch (it's really nice to be on the covered porch when it's raining). We also appreciate having a separate cottage rather than an attached condo because of the privacy and quiet (for example, you don't hear people upstairs or through the walls), as well as how light-filled the cottage because of the many windows surrounding the cottage (which you don't get in an attached condo). We feel VERY lucky to have found our cottages at the Cottages at Camp Creek. We do everything we can to make our cottages feels like fully furnished and equipped beach homes rather than rentals. We make sure the furniture, bedding, and everything else is charming, comfortable, and high quality. Our guests always notice that we pay attention to the details. The books, games, movies, puzzles ensure you always have something to do, even on rainy days. The pool is huge for a small community - I love swimming laps in the pool in the morning in the summer and floating around the pool or sitting in the hot tub at night watching the stars come out one by on). The beach is awesome - I love taking a book to the beach and just reading for hours. We fish from the beach and have caught red fish, pompano, and white fish for dinner. We enjoy the short walk to Alys Beach (with the coffee shop, Charlie's donut truck and George's casual restaurant with the best grouper sandwiches and fish tacos). When not at the pool or beach, we rest on the covered porch and love the way it feels during a rainstorm as well. Our guests (and we) really appreciate the low traffic in this area for safety and ease of getting around, especially in the peak seasons when we want to avoid the bumper to bumper traffic in some of the busier beach communities - what a relief to not have to deal with traffic! Frankly, we love everything about the cottage, the charming Cottages at Camp Creek, and this beautiful area. Both bathrooms have a tub/shower combination. The cottage is across the street from a beautiful white sand beach with awesome sunsets. You'll have plenty, including plastic for picnics at the beach and young children. There are 5 chairs at the dining table, and we pull in the four chairs from the cafe table on the porch when we want to add more people (up to 8) at the dining room table. Family cable - great for rainy days. There is a small private yard just off the back porch, with native Florida trees, palmetto plants, and more. The trees and plants provide both beauty and privacy. You can rent water sports gear and have it delivered to the cottage/beach from several local businesses. Our cottages (we also own Key Lime next door) are an easy 4-5 minute walk to a beautiful white-sand beach with lovely sunsets and are within walking distance of Alys Beach and Rosemary Beach where you'll find restaurants, shops, outdoor entertainment (including free concerts and movies during the peak summer season). Although we have a lovely quiet beach across the street and a BIG pool in our community here at the Cottages at Camp Creek, we also have the pleasure of being with 1/2 mile of the community of Alys Beach that has restaurants, a coffee shop, a play yard (play houses and hills) for children, amphitheater with movies/concerts/more during certain seasons/weekends, and a walking trail through the native environment for those who want to see what the area looked like before construction. We are also about 1 mile away from the community of Rosemary Beach that also has restaurants as well as shops, coffee shops, a spa, bike and beach equipment rentals, and more. Even though all of this is nearby, we tend to spend our time at the beach, at the pool, or relaxing/dining on our fully furnished porch!